Well, previous time we already explain some tips on how to prepare your dog to the beach on some tips for taking your dog to the beach. However, sometimes the beach can be a friendly place but also can be a harmful place to your lovely dog. Therefore, how to avoid beach hazards on your dog? Will, our dog listen to our command, you can see it on tips on how to make a dog listen to your command. What we should do if our dog cannot swim well? Well, all your answers wil be in the following here. Let’s check it out. The sea water it smells fishy and it tastes salty. While your dog plays around shorelines. He mights be drinking lots of salty water that it is not good for your dog. The salty water can give bad effect, likes tummy ache and dehydration. So, that is why you should bring much of fresh waters. It can avoid your dog gets dehydration. Watch out your dog while your dog is playing on the shorelines. The dangerous wave could come suddenly. It can pull your dog to the deep sea water and while your dog cannot swim well he can fall down. You should be ready on his side always. The big wave can happen sometimes when you off guard your dog. It will be safe if you go play and swim with your dog. The beach litter may found too, while he plays around the beach. The beach litter is contain everything from industrial waste. It can be dangerous to your dog if he licks or even eat it. Make sure you watched your dog carefully while he is sniffing around. Your dog may have some infections and disease if he licks it. The raw fishes here is some of dead fishes. While you go to the beach that found some raw fishes, do not let your dog eat it. That dead fishes contain many parasites that potentially deadly. Offcourse it can be harmful to your dog. Beware and keep an eye on him what he does. It can be dangerous while your dog is swimming and he doesnot know there is a fishing line in his foot or maybe he found a sharp hooks on the sand and it can hurt his feet. That is wht you should wear his feet with its booty. It will make his feets safe from any sharp object. Well, overheating is the most problem that you cannot avoid it, right? The weather on the beach is so hot. Let’s check out here, you can do prepare some things for your dog. First, get his sunblock to make sure it is suitable with his skin. Second, you can place a hat or sunglasses for your dog. Then, it looks so cute. 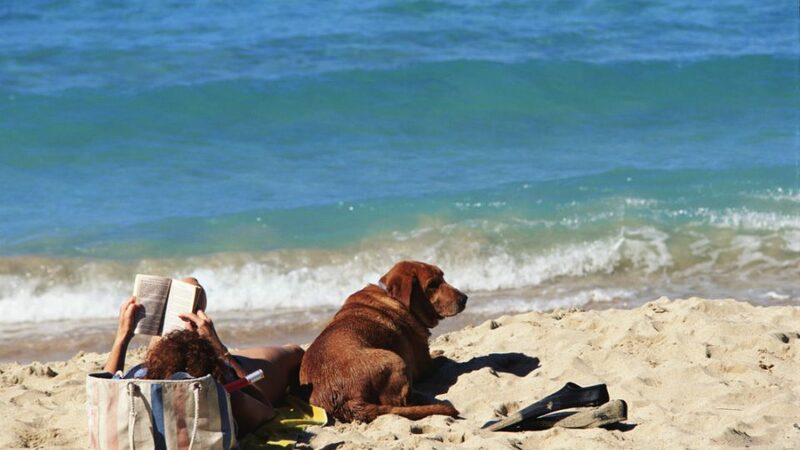 Last, you can bring your beach umbrella, that can make your dog more comfortable when he takes a rest. The sands, it feels very hot. Use your boots and also for your dog too. It can cover his feet to avoid the hot sands. Then, your dog will very enjoyable and comfortable when he walks with you, everywhere around the beach. Your dog is happy and the owners also. Let’s take a walk and enjoy the beach. The wind blows so hard, it makes sand flies. This flying sands can make your dog’s eyes irritation. But, do not worry you can wear something like googles to your dog. It is look fancy and also keep his eyes safe from flying sands. However, it will more safe if you do not let your dog to play around the beach. You can walk back with your dog and find a place that safe to save yourself and your lovely dog. Does your dog love to swimming in the sea? If it yes, please watch out your dog carefully because the wave comes strong sometimes. Make sure you use your super vision to your lovely dog. If your dog cannot swim well, you can shout or ask for help to beach guard. Then, he or she can help to reach your dog. In this case, do not too much panic, okay. Just think positive and take a deep breath. Does a seaweed healthy for a dog? Yes, it does. It much of vitamin and minerals for your dog and it can give many benefits to your dog. However, how about the seaweed that dry and washed up by on the shorelines? Well, if your dog eats the dried seaweed rhat washed up on the shorelines it has not any benefits to your dog. Otherwise, it can bring some diseases to your dog. He can get tummy ach and else. Please, call your vet immediatelly now. He needs your help. There are lots of rocks and shells that washed up on the shorelines, otherwise plastics, broken glases and other sharps objects left behind in here. Please, to wear cover pads or his boots to avoid cuts and lacerations on the pads of his feet. It can potentially infection if your dog do not wear his boots. A breathable though bootie with non-slip bottom it can make your dog’s feet safe from the sharp objects on the shorelines. Keep an eye to your dog also if he sniffing around shell and he wants to eat it. Why you as his owner must keep an eye for the other dogs? Well, it is not always the other dogs are friendly. Sometimes, they can be enemy of your dog. So, this is the reason why should beware and use your super vision to keep your dog safe from the other dog. The bite wound, you should avoid this happen to your dog. Make sure he still stays on a leash. If your dog is small just take it back and bring your dog away from the other dogs. Hopefully, the above on how to avoid beach hazards on your dog can useful for you, the dog lover when you take him go to the beach with you. Remember, you should take care him carefully because he is your family too. Otherwise, there are lots of information more about dogs such as like these, tips on how to train your dog to use the bathroom outside, how to properly clean your dog’s teeth, and also how to treat dog ear infection without a vet. Take care and love your dog as well, okay.